Why wasn’t Glenn Weiss played off during his Emmy’s speech? 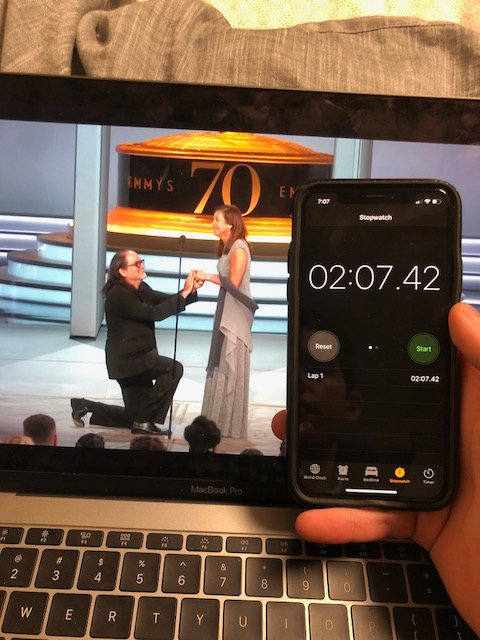 If you’re connected to vuNet and have logged onto Twitter.com in the past 72 hours, then you probably saw the story of the surprising Emmy Proposal. Glenn Weiss, who won the Outstanding Directing for a Variety Special award for directing the Oscars, gave a very emotional speech. He talked about how much he loves his girlfriend Jan and then, he dropped this bombshell of a line in front of the Hollywood elites: “You wonder why I don’t like to call you my girlfriend? Because I want to call you my wife,” and the room erupted. He brought her onstage, got down on one knee, and popped the question. People were cheering and crying. Everybody loved Glenn Weiss. Correction: almost everybody loved Glenn Weiss. 2:07.42!! You have to be kidding me. That’s almost a minute and a half too long! But we’re just supposed to let it fly because Comic Book Guy from the Simpsons wants to get married? No thank you. What happened to the days when rules meant something? Think about what this teaches our children. Obviously this is a gateway crime to manslaughter. Hey Colin Jost and Michael Che, a good host would have ruled with an iron fist and played them off the stage. But I get it. It’s cool. It’s hip. It’s rebellious. It’s young love between any normal 57-year-old and 69-year-old (those are their real ages. You can look it up). But if you wanna propose to your lady, maybe do it in the Uber home and not waste our time. I miss the old days where you would thank your agent, cast, and wife and then tell your kids, “If you’re watching this, go to bed.” Shame on you, Glenn Weiss. Shame on you.